“Bodak Yellow” dethroned “Look What You Made Me Do” for the No. 1 Billboard spot this week. This week Cardi B's "Bodak Yellow" dethroned Taylor Swift's "Look What You Made Me Do" for the No. 1 spot on Billboard's Hot 100 chart. "Bodak Yellow" exponentially became the song of the summer, and is the second No. 1 solo single by a woman rapper following Lauryn Hill's “Doo Wop (That Thing)” in 1998. During her reaction speech Cardi poked fun at Swift's song, but previously stated that she likes the mega pop star. According to Cardi B's Instagram, Swift sent her flowers congratulating her on the No. 1 spot, so it looks like it's nothing but love between the two of them. 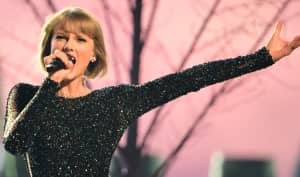 "Look What You Made Me Do" was the first single released off Swift's upcoming album Reputation. Revisit Cardi B's cover story from FADER 110.